The ostrich, while enjoying his freedom in African deserts, little dreams that it takes thirty odd dollars of him to trim a fashionable bonnet. – 1881, Redwood Gazette, Redwood Falls, Minnesota. The new hat purchased by Laura Ingalls after teaching the Wilkin School in the spring of 1885 was said to be a rolled brim cream straw (narrow on the sides, but rolled so that the front went down to the middle of Laura’s forehead), with a darker cream satin ribbon around the rim, and decorated with three ostrich tips at the left side. 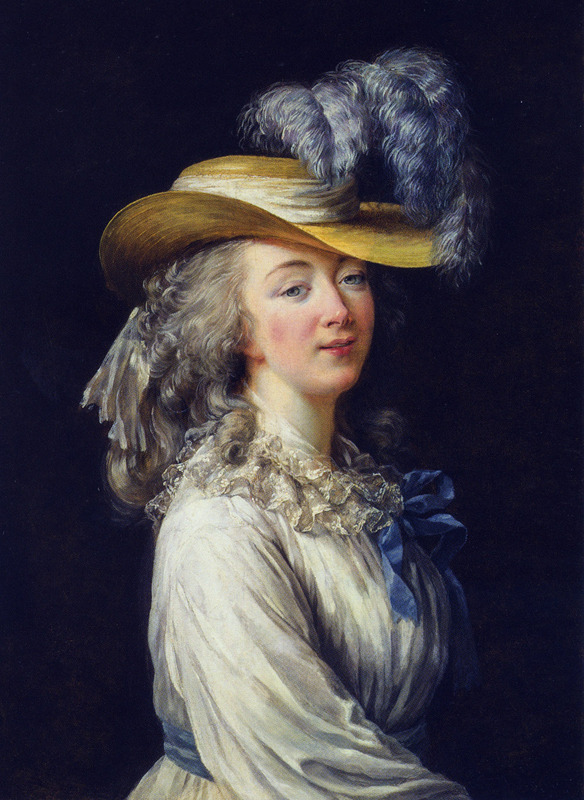 Advertisements at the time called such a hat a variation of the “Du Barry” hat, a style made popular by Madame Du Barry, a mistress of Louis XV almost a hundred years earlier. You can see a painting of Mme. Du Barry in such a hat HERE. Straw hats were so popular in the spring of 1884 and 1885 that one New York shop was said to display over one hundred different shapes for trimming, and three ostrich tips thrust through the straw were said to be most suitable. The Boston Herald of February 1885 advertised ostrich tips usually fifty to seventy-five cents each, on sale for thirty-three. Often, ostrich tips weren’t made from ostrich feathers, because it was said to be a waste to cut an ostrich plume into bits, and smaller ostrich feathers usually weren’t of a good texture or fiber. In 1885, a full ostrich plume could be sold for $20, while imitation tips could be had for from ten cents to $4 or $5. Often, peacock feather or vulture feathers were used, dyed to the desired shade. There is no record of Laura’s purchase of three ostrich tips from Miss Bell, but in her record of sewing for Mrs. White, Wilder recorded that one plume (for a hat) cost sixty cents, and Mrs. White sewed it on for twenty-five. THE MANUFACTURE OF ORNAMENTAL FEATHERS. The Pall Mall Gazette says: “An interesting account of the manufacture of ornamental feathers, an industry which employs about 240 working women and apprentices in Vienna, is given in the ‘Translations of Official Austrian Reports on the Universal Exhibition’ in that city last year. The coloring is done by men, the other processes mostly by women. African ostrich feathers are most usually manufactures. These are white, black, gray and dappled, and are classified according to quality as ‘prima,’ ‘secunda,’ etc. Other feathers frequently worked are those of the white heron, bird of Paradise and marabou (there are genuine marabou feathers and false). The white prime ostrich feather is the finest of all. The feather is cleaned first by a cold soap bath, well washed twice or thrice, and then put into warm soap baths, afterward well washed in cold water, then blued a little, pressed, and swung to and fro in the air until the hairs have spread and the feather is quite dry. Next, with a small, sharp knife, the strong rib at the back is cut away. The feather loses its stiffness and acquires pliability. With small feathers this is obtained by scraping the rib with glass. Then the hairs on each side of the rib are made to curl in with a blunt knife and the requisite uniformity of shape is given them by combing the over a slightly warm iron. Next, in order to hide the rib, the worker, with a blunt knife, twists here and there some hairs of the feather spirally over the rib until it is completely concealed by them. The feather is then threaded with a wire, folded in paper and so completed. The same process is followed with gray and black ostrich feathers, except the gray are generally and the blacks always colored. White feathers are only colored for some particular fashion of color, as rose, violet, etc. If the hair on a feather is not dense enough, or the feather is defective, then two or three feathers are sewn together and curled. This is done with both short and long feathers. Long feathers are called ‘leaf feathers,’ ‘Amazons;’ short feathers generally three of a bundle are called ‘panache.’ Single and sewn feathers are distinguished in both. The hair of the ostrich feather is also much used for the manufacture of fancy feathers—cockades, fringes, etc., are made of these. The feathers are twined by a machine, and then joined to the hairs of other feathers. These combinations are called ‘pleureuses,’ and pieces of ostrich feathers are sewn together to a length of come ells, and called ‘bordures,’ and are used to decorate dresses. There is an American ostrich feather called ‘vulture,’ which is worked like the ‘African,’ but is inferior to it in quality. Tempting white feathers called marabou are much worked. They are used for fancy feathers; the points of small white or colored pigeon feathers and very small fragments of silk and the like are joined to them. ‘Bordures’ for ball dresses are made of them. It is evident from this account that ‘to show the white feather’ is a process which entails some trouble and expense. – January 28, 1875. The Redwood Gazette, Redwood Falls, Minnesota.